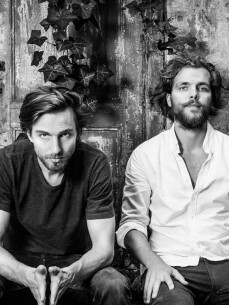 Polynation is an electronic duo that originated from the minds of Stijn Hosman and Hessel Stuut. Fusing moods of electronica with techno, ambient and world music, Polynation is foremost an exciting live-act that seeks out to start a musical conversation based on spontaneous interaction, improvisation and a more band-like approach towards electronic music. Stijn Hosman has a broad musical influence playing piano, creating music for films and art projects and having played several years as an electronic music producer and dj. Hessel Stuut’s musical background is mainly playing acoustic drums and composing music for art- installations and video. They found a shared love for deep synth and eclectic beats and decided to team up. The dialogue between the long-haired guys is defined by the use of electronic, acoustic sounds and live drums to create a lush musical canvas influenced by live-acts like Bonobo, Caribou, Nicolaas Jaar and Minilogue.